A correctly sized valve has the required capacity to deliver the right flow rate at minimum, normal and maximum flows and helps to safeguard optimal control both as far as comfort and economy are concerned. An oversized valve has poor controllability. An oversized control valve implies that all normal operations will be confined to small openings of the valve with great risk of variable sensitivity and aggravation of any uneven movement of the valve. Poor accuracy and unstable control often result. The smallest change in stroke in an oversized valve will result in large flow variations. As the valve opens or closes, large flow speeds and a powerful turbulence are created between the plug and seat. This both erodes the valve and causes noise. 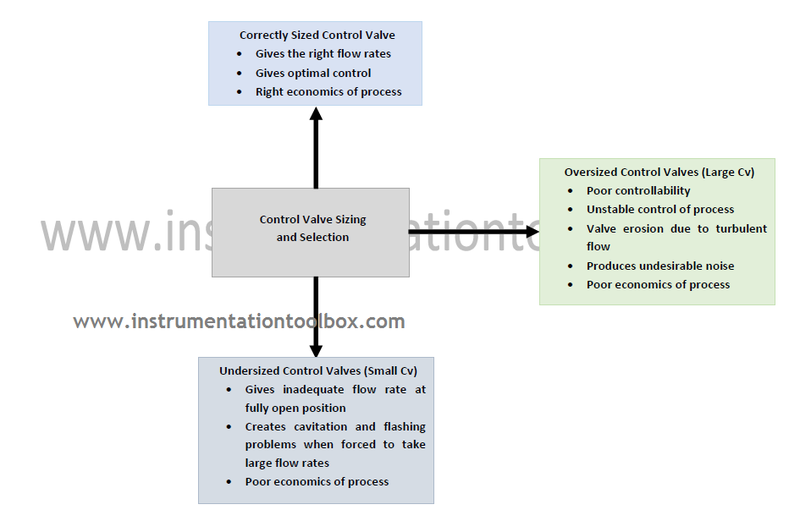 If the control valve is undersized (Cv - too small), the required flow rate will not be achieved even when the valve is fully opened. If a higher pressure is applied to force a higher flow rate across the undersized valve; not only the pump energy will be excessive but also the valve may cavitate or develop flashing.